Comments: Shown above are the Scottsville students attending the Brady School at the southeast corner of Main and Valley Streets in Scottsville in December, 1906. By the 1907 school session, Scottsville students and faculty moved to a large double-gabled gray building with green trim and red sashes, sitting so grandly on "School Hill" above Valley Street. 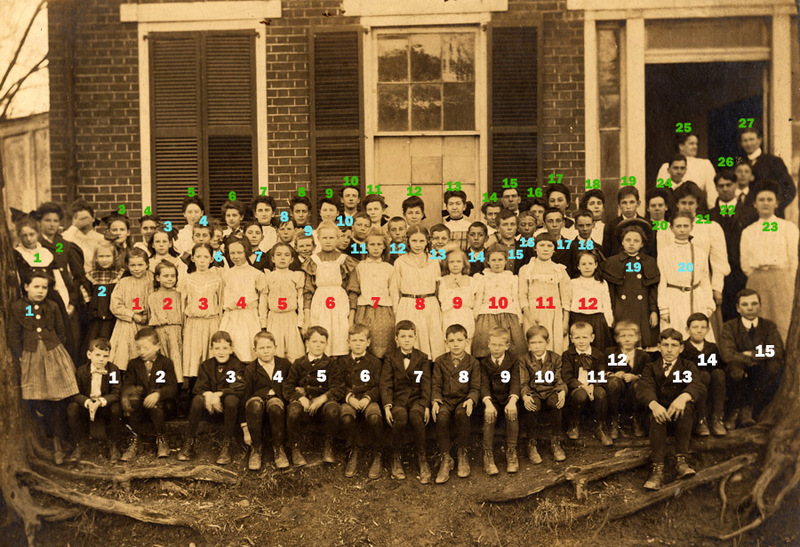 This Scottsville School on the hill measured sixty-eight by forty feet and contained four large rooms with a hall and cloakrooms on the first floor. An assembly room occupied the second floor and had a superb view of the river-bordered town. 12) John Briggs; 13) Unknown; 14) George Thomas; 15) Everard Agee. 9) Willie Dawson; 10) Sarah Londeree; 11) Unknown; 12) Emma Baber. 16) John Pitts; 17) James Londeree; 18) Tom Goodman; 19) Susie Blair; 20) Fannie Anderson. 25) Ella Farrar; 26) W.S. Dabney.